This article aims to help you remove .PRIAPOS virus file ransomware and decrypt the encrypted files by this ransomware infection for free. Another iteration from the massive Globe ransomware family has popped out into the open, carrying the name .PRIAPOS as it’s file extension suggests. The virus aims to use AES encryption algorithm to render the files on the infected computer no longer able to be opened. Priapos ransomware also drops a ransom note. Names Instructions!! !.hta in which the virus demands victims to pay a hefty ransom fee in order to restore the files encrypted by this virus. The fee is 1.5 BTC and security experts advise not to pay it, since there is a decrypter for this ransomware virus and you can restore your files for free. In case your system has been infected, read the following article. Short Description Variant of Globe family of ransomware viruses. 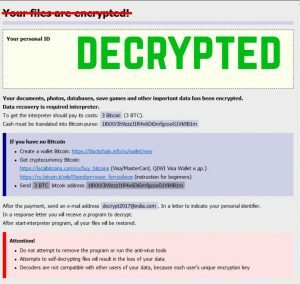 Encrypts files and demands 1.5 BTC ransom to be paid to decrypt them. User Experience Join Our Forum to Discuss Priapos Virus. Via spam e-mails that have convincing messages in them to either open an attachment or click on a web link sent via the mail. The messages usually portray the malicious attachment as a legitimate document of importance. Via malicious web links posted as comments on forums or sent via chat on social media, etc. Via various other methods, including uploading the file online as a fake setup, key generator, update of Java or Adobe or license activator of some sort. Whatever the case of .PRIAPOS file virus may be, once the infection file which the cyber-criminals want you to trigger is executed, the inevitable happens and the ransomware slithers unnoticed on your computer. One of the main actions .PRIAPOS ransomware performs is for the virus to drop the malicious files, including the file encrypting your data on your PC. This file is .exe format and has a completely random file name, for example 28d2h832.exe. Such shadow copies are essential to restoring files, because they are the backed up versions of your important data, if you have enable Volume Shadow Service on your Windows machine, that is. Before paying you can send us up to 1 files for free decryption. The total size of files must be less than 10Mb (non archived), and files should not contain valuable information. • The easiest way to buy bitcoins is LocalBitcoins site. You have to register, click ‘Buy bitcoins’, and select the seller by payment method and price. Priapos ransomware is very careful as to which types of files are encrypted. The virus skips crucial files that are required to run Windows and only encrypts documents, photos, video and audio files and other important data. Fortunately, the virus is decryptable as you will see if you keep reading this article. 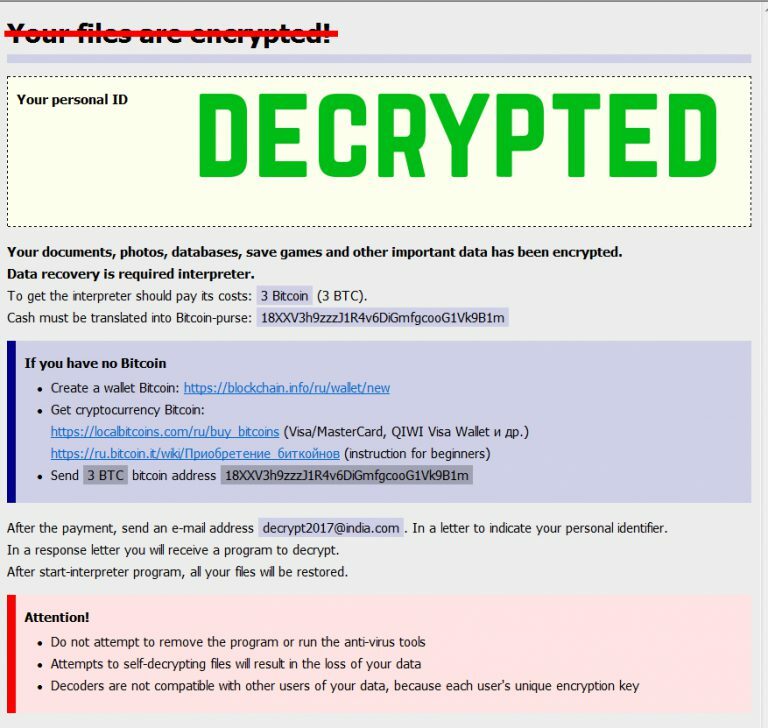 Before decrypting your encrypted files, it is important to remove this ransomware virus from your computer. The best method to do this is to focus on removing the ransomware infection by using the instructions below. However, security experts advise victims to remove the virus automatically with the aid of an advanced anti-malware tool. Such tool will not only remove the main files, but also locate all the objects associated with .PRIAPOS and delete them as well, so your PC would run as if the virus was never there. Threats such as Priapos Virus may be persistent. They tend to re-appear if not fully deleted. A malware removal tool like Combo Cleaner will help you to remove malicious programs, saving you the time and the struggle of tracking down numerous malicious files. Threats such as Priapos Virus may be persistent on your system. They tend to re-appear if not fully deleted. A malware removal tool like SpyHunter will help you to remove malicious programs, saving you the time and the struggle of tracking down numerous malicious files. Note! Your computer system may be affected by Priapos Virus and other threats. SpyHunter is a powerful malware removal tool designed to help users with in-depth system security analysis, detection and removal of threats such as Priapos Virus. 1. Install SpyHunter to scan for Priapos Virus and remove them. 2. Scan with SpyHunter, Detect and Remove Priapos Virus. Ransomware infections and Priapos Virus aim to encrypt your files using an encryption algorithm which may be very difficult to decrypt. This is why we have suggested several alternative methods that may help you go around direct decryption and try to restore your files. Bear in mind that these methods may not be 100% effective but may also help you a little or a lot in different situations. Note! Your computer system may be affected by Priapos Virus or other threats. Remove Priapos Virus by cleaning your Browser and Registry. Fix registry entries created by Priapos Virus on your PC. Combo Cleaner is a powerful malware removal tool designed to help users with in-depth system security analysis, detection and removal of threats such as Priapos Virus. Step 5: In the Applications menu, look for any suspicious app or an app with a name, similar or identical to Priapos Virus. If you find it, right-click on the app and select “Move to Trash”. Step 6: Select Accounts, after which click on the Login Items preference. Your Mac will then show you a list of items that start automatically when you log in. Look for any suspicious apps identical or similar to Priapos Virus. Check the app you want to stop from running automatically and then select on the Minus (“–“) icon to hide it. Remove Priapos Virus – related extensions from your Mac’s browsers. A pop-up window will appear asking for confirmation to uninstall the extension. Select ‘Uninstall’ again, and the Priapos Virus will be removed. When you are facing problems on your Mac as a result of unwanted scripts and programs such as Priapos Virus, the recommended way of eliminating the threat is by using an anti-malware program. Combo Cleaner offers advanced security features along with other modules that will improve your Mac’s security and protect it in the future. Hey !, I found this information for you: ".PRIAPOS Virus – Decrypt Your Files (Free)". Here is the website link: https://sensorstechforum.com/priapos-virus-decrypt-files-free/. Thank you.